Keep your precious kitty's health in check -- always. If you recently brought home a sweet, bouncy little kitten, not many things could put a damper on your mood worse than witnessing her having a seizure. A variety of different and potentially dangerous factors can cause little felines to experience convulsions, from kidney failure to epilepsy. 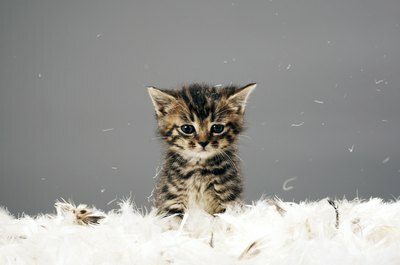 Epilepsy is one of the most common culprits behind kitten seizures. The neurological condition causes a cat to experience frequent and consistent convulsions. Seizures can happen seemingly at any moment, and are abrupt and random episodes of uncontrollable behavior and activity. Some examples include dilated eyes, mouth foaming, excessive drooling, breathing problems, twitching muscles, and aggressive, jerky body movements. In some cases, seizures also take shape as severe and unexplainable changes in mood -- think uncharacteristic hysteria or rage in your typically mild-mannered and gentle kitten. If you notice any of these signs, immediately seek emergency medical attention for your pet. If your little kitten accidentally ingests a poisonous substance, she may also have a seizure. Toxic plants are a big cause. Other toxic, everyday substances that can trigger seizures in kitties include insecticides, rat poison and antifreeze. Liver and kidney disorders are also often behind kitten seizures. If you are worried that your precious pet may be suffering either from liver or kidney failure, look for other signs such as appetite loss, exhaustion, throwing up, halitosis, dry coat and anemia. In these situations, waste no time in seeking out immediate veterinary attention for your little fluff ball. Seizures are quite often a serious symptom of a bigger medical condition. Because of this possibility, it is crucial to always immediately take your pet to the veterinarian if you notice any unusual symptoms, behaviors or episodes. Kitten seizures are sometimes related to ailments including diabetes, heat stroke, brain tumor, hypoglycemia and diabetes mellitus. Nutritional deficiencies can also occasionally lead to seizures in growing young kittens. If you suspect that your kitten lacks certain vitamins that could be causing her seizures, speak to her veterinarian about putting together a well-rounded, protein-packed nutritional plan to get her back on the path to glowing health. B vitamins in particular, like niacin and thiamin, are especially important for young felines. How Can There Be So Many Kinds of Kittens in a Single Litter? What Does a Cream Point Persian Kitten Look Like?